Words cannot do justice to the loss of Donald S. Joyce, Crosley Bendix, C. Eliot Friday, Omer Edge, Izzy Isn’t, Bud Choke, Leland Googleburger, Wang Tool and Dr. Oslo Norway, who all died yesterday in Oakland, CA of heart failure at age 71. Perhaps a loud, mournful squawk from Don’s “Booper” feedback oscillator would better sum up the feelings of Negativland, his comrades and partners in art for 34 years, who are devastated. 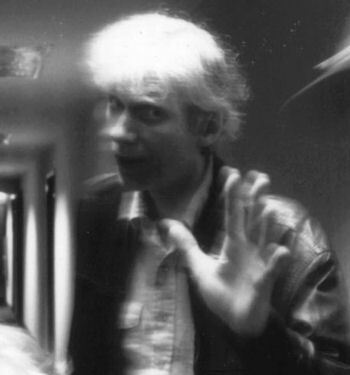 It was Don who coined the term “culture jamming”, and who devoted his life to the art of sound collage and his weekly live radio program, “Over the Edge”, on KPFA FM in Berkeley, where it has continuously lived on the dial on Thursday nights at midnight since 1981, without interruption. Don was a DJ at the station when a mutual friend, Ian Allen (who died this past January) introduced him to a group of Contra Costa County noise/music artists called Negativland, who entered the station one night, armed with stacks of recordings and electronic gear, and immediately transformed Don’s “normal music show” into a free-form collage sound odyssey, totally blowing open Don’s idea of what a radio program could be and what a DJ could “do”. And in Don Joyce (whose initials were conveniently also “DJ”), Negativland had found its “lead vocalist” without even realizing they were looking for one. It was Don who took the idea of reshaping previously recorded words – in a pre-sampling age – and ran with it to an extent and depth never before heard, and never equalled. “Recontextualization” became his weapon, with the 1/4” tape machine and razor blade his ammunition, and the radio “cart player” – an entirely forgotten piece of broadcast history using endless-loop tape cartridges, which he used until he death – his delivery system. 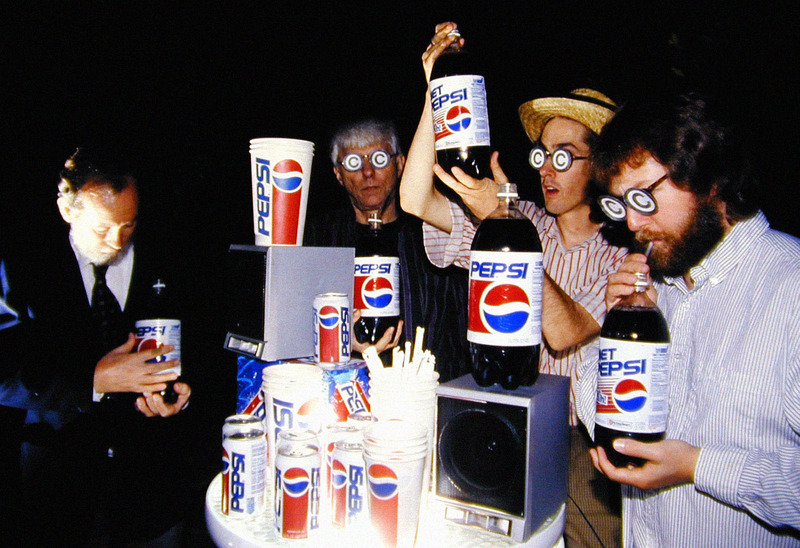 When he and Negativland discovered their mutual love for “found” sounds, an intensely collaborative creative partnership was cemented. It continued non-stop for the ensuing decades, with Don endlessly scanning the airwaves of radio and television, along with his massive LP collection, for new material, day by day, week by week. There was often a TV and a radio on in his room simultaneously, cassette recorders always at the ready. And as an extremely shy and often quite reclusive person, radio was a perfect medium for Don. He could reach thousands of people each week without having to deal with very many actual humans, just as he preferred it. Creating art was not only Don’s full-time pursuit, it was literally his life’s work. He had made it clear to the group as recently as a few weeks ago that he was happy and satisfied with what he had been able to achieve in his life, and were he not able to continue to work, his life would feel as good as over. Don Joyce’s singular editing style was laced with profundity and silliness in equal measure. His work was that of a dada humanist, able to wring unforgettable sentiments and statements out of material which originally spoke something entirely different. Hugely inspired by both the droll radio of Bob and Ray and the reckless free-form of the Firesign Theatre, he created a wicked language of repurposed purple prose which has inspired legions of other collage artists over the past three decades. He was the father of the form. One need only to listen to his work on “Time Zones” (on the Escape from Noise album) or “Piece of Pie” (in the No Business CD/book) to immediately tune into his unique wavelength. He was also an animal lover, a Bob Dylan fanatic, a staunch atheist, a convicted (but never jailed) draft dodger, and slept with the radio on. Cranky, curmudgeonly, loyal and fair, brilliant, hilarious and uncompromising, he was steadfastly devoted to the creation of his art, full-time, for more than three decades. He leaves behind not only his massive recorded legacy via “Over the Edge”, but his work on nearly 30 Negativland albums, two books, three DVDs, and his giant, meticulous paper collages. There was Negativland before Don Joyce (though not by much), and there will be Negativland after (indeed, Don stopped touring with the group in 2010), and he made it clear that he wished for the group to continue on in some fashion if he was the next member to go. At the very least, there are two nearly-completed albums in the works and possible live shows, and, in late 2015, all 34 years of “Over the Edge” (5000-plus hours’ worth) will be available until the end of time on the Internet Archive, the result of a multi-year archiving project. But there will never be another Don Joyce. Don Joyce was born in Keene, New Hampshire, where he spent his childhood obsessed with drawing, leading to him getting a masters degree in painting at the Rhode Island School of Design. By the late 1960s, he had relocated to Northern California (with a brief stint living in Toronto during Vietnam) where he lived, in Oakland, until his death. He is survived by his sister, his brother, a spider plant which thrived on a window sill through decades of choking cigarette smoke, and his Negativland family. Gnegnegne, quaquaqua, te lo sei letto solo tu sto rotolo. Ma vai farti fottere le tonsille e il culo, tu e sto coglione crepato. una fotina più sfocata non c'era? E che cazzo c'entra? Ti manca la chat eh? Vecchio necrofilo nazista. Vabbe, allora beccatelo qua un vaffanculo a te e a tutta la razza tua, morti e discendenti inclusi.